Over past few weeks I’ve been blogging about the luxury retail brand ‘THEN AND NOW’. It’s been a pleasant experience giving you all the latest information or discounts, the luxury online retailer is offering as well as myself regarding my contacts etc. Since the posts I have posted regarding ‘THEN AND NOW’ have got excellent feedback from you all, I’m going to continuing blogging about this exciting ever growing luxury online retailer. 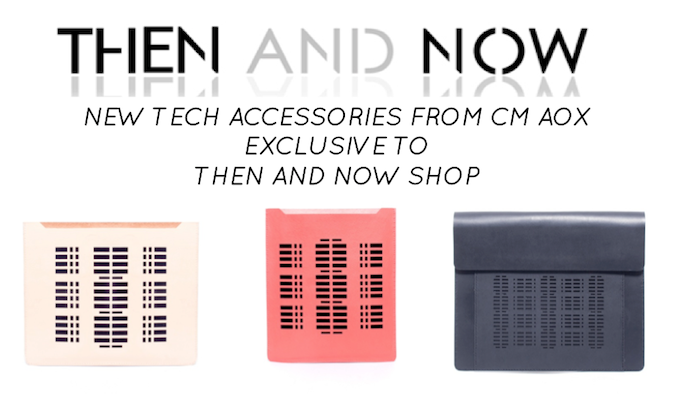 New and Exclusive to ‘THEN AND NOW’ are a tech accessories label called CAM AOX which have launched just this year by two Central Saint Martin’s graduates Alexander Freudenberger and Caroline Minar. (This is what I like about ‘THEN AND NOW’ they share this passion of expressing new talent; this is what I’m always looking for). These two graduates have joined their own completely different disciplines Product Design and Fashion/Print, into one project which has made the project into the conclusion of appreciation of artisanal craftsmanship. CAM AOX products are produced within the heart of London through laser cutting machinery to apply patterns and to reliably produce consistent quality. These products encourage less disposable consumption and simultaneously radiates that long lasting preciousness of a hand finished and functionally designed goods. Since the launch of CAM AOX Freudenberger and Minar’s first collaboration is based on aesthetics of the digital age, media art and the rigid visual language found within the micro-structure of deconstructed computer devices. The first collaboration collection offers the craftsmanship in a very stylish statement mantra. (Which I love) this is due to the detailing of the pattern work. The first collection since the launch of this exciting developing brand includes black leather Velcro tablet, unisex smart phone case, and a horizontal tablet sleeve. All of which is available to purchase from ‘THEN AND NOW’ between, the price range of £75-225. These products by CAM AOX are perfect Christmas presents for everyone! 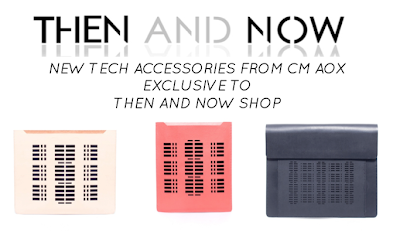 · Remember if you invite a friend to ‘THEN AND NOW’ you can receive £20 off your next purchase. Don’t miss out!